Register 2 months in advance and save $1,000. In retrospect, should your company have managed your last integration faster or slower? When does your company start integration planning? When do you launch your integrations teams? 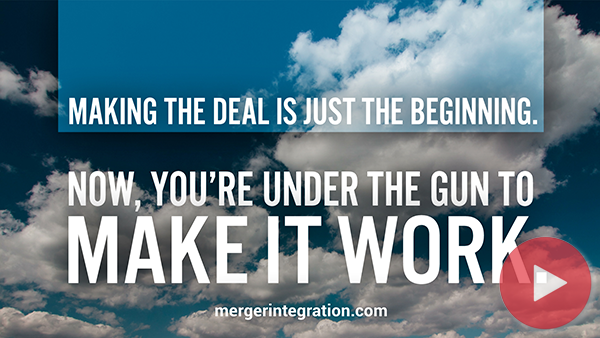 Before close, does your company complete integration plans for Day 1 through Day 90? Which one of these tasks is most difficult for your company to achieve when managing an M&A integration? In which functional area do you see the biggest need for improvement in terms of integration skills/capabilities given the focus of your merger activity? Who dedicates an internal group (i.e. IMO) to their integrations? Is the compensation scheme of integration team members linked to integration goals? In your company, who receives M&A communications-related orientation/training? Does your company successfully communicate integration objectives to employees prior to close? And during the first 100 days after close? Whose communication processes are effective? Would your past mergers have substantially benefited from greater cultural understanding prior to the merger? How would you rate your organization’s effectiveness (on a scale of 1 to 10) at handling cultural issues in mergers and acquisitions? Does your company perform any sort of cultural assessment in the process of acquiring/merging other companies? Who conducts post-mortems and document lessons learned on transactions? If you would like to re-publish one article from MergerIntegration.com on your website for free, we will provide permission (always written) in certain instances. Please email [email protected] for more information. Under the gun to make the deal work? PRITCHETT Merger Integration Certification Workshop Attendees, Consulting Clients, and Paid Website Subscribers can access this resource. They can also access everything else-all the presentations, playbooks, books, articles, checklists, software, assessments, webinars, research, tools, and templates on MergerIntegration.com. Clients and Subscribers may log in here. Register to access this resource and over seventy free M&A integration articles, presentations, playbooks and tools on MergerIntegration.com. Registered users can log in here.